Positive Displacement Blowers Market size is forecast to exceed USD 3 billion by 2024; according to a new research report by Global Market Insights, Inc. Positive displacement blowers (rotary lobe blowers) market will be majorly driven by increasing demand from water and waste water treatment industry, which is rapidly growing over past few years. Rising demand for fresh water for drinking, industrialization and agriculture has fueled positive displacement blowers market growth in 2017. It is projected that by 2025 global water & waste water treatment industry will reach to USD 674.72 billion as various countries are increasing the share of their financial budget on water and waste water treatment processes. Another prime growth driver for rotary lobe blower market will be packaging industry, which has shown some excellent growth number in past years and is likely to grow with rapid growth rate in future. It is anticipated that by 2024, global packaging industry will cross the mark of USD 1 trillion, this exponential growth in packaging industry shall increase the positive displacement blowers demand over the forecast period. High rotary lobe blower price and increasing trade barriers pose a threat to rotary lobe blowers market in coming years. Moreover, increasing trend of isolation and ongoing trade wars between countries such as China and U.S. will further hamper the positive displacement blowers demand over the forecast period. There’s threat of substitution from various blower alternatives available in the market such as regenerative blowers. 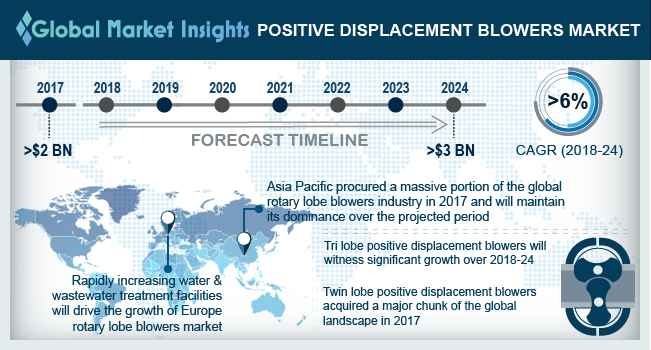 Tri-lobe blower shall be the fastest growing segment in the overall positive displacement blowers market during the forecast timeframe. Countries including China, India, Japan are increasingly accepting tri-lobe blowers technology for industrial, oil & gas and chemical applications. In India, twin lobe blowers are still used at a large scale. Asia Pacific accounted for a major chunk of global rotary lobe blowers market in 2017 and shall continue to hold the same position by 2024. Increasing local product manufacturers in the region and multinational giants setting manufacturing plants due to cost competitive labor and vast domestic market shall be propelling product demand across the region. Europe is another prominent market for rotary lobe blowers market due to its rapidly increasing water & wastewater treatment facilities across local levels. European chemical industry generates approximately USD 900 billion revenue every year. The region is among the top chemical manufacturer and exporter in the world with more than USD 70 billion trade surplus every year. The positive displacement blowers market is diverse and includes multi-national players to local medium scale companies as well. The rotary lobe blowers industry has some chief global players including Aerzen, Kaeser, Universal Blower Pac, Shandong Zhangqiu Blower Co., Ltd, Howden, Kay International, Busch SE, Gardner Denver Holdings, Inc, Hitachi Ltd., Siemens and Eurus blowers. Subsidiary and joint ventures are major strategies adopted by players operating in this industry. For instance, In June 2017 Busch SE has acquire slightly more than 30% stakes in its domestic rival Pfeiffer. This move is likely to give advantage to Busch SE in the coming years in domestic pumps and blowers market. Most of the companies have their own sales and service networks in various regions for their products. Also, some of the manufacturers sell their products through online channels.